These are the protective covers for the Iron Mike Pitching Machines (MP4, MP5, and MP6 models). Helps Extend Life of Machine. Made of Heavy, Waterproof Nylon. Full Length Coverage. Custom Fitted. 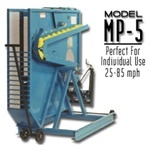 This is the machine guard for the Iron Mike Pitching Machines (C82, MP4, MP5, and MP6 models). 4' Wide x 6' Tall, Heavy #60 Weight Net, Held in Place by Machine. A compact, inexpensive trainer for the kids that makes a great starter machine. An "arm-style" machine that throws up to 60 MPH. A heavy-duty, mobile "arm style" pitching machine that is ideal for individual use. Holds up to 38 baseballs at once. Throws up to 85 MPH. A durable, "arm style" pitching machine that is ideal for teams. Holds up to 600 baseball at once. Throws up to 85 MPH. The Favorite of Major League Teams!!! The MP-4 is the top of the line hopper-fed "arm style" machine. It has the same features of the MP-6, but has extra reinforcements on the frame to protect against batted balls. It also includes a Positive Feed Control which ensures good ball flow when using seamed balls. Holds up to 600 baseball at once. Throws up to 85 MPH.